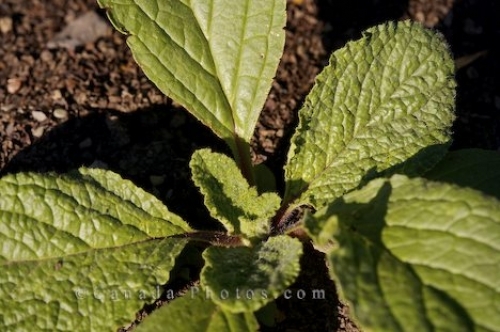 The stems and leaves on the Borago officinalis herb plant grow with a bristly, hairy type of texture and when fully grown, the leaves will be anywhere from two to six inches long. These bright green colored leaves belong to a plant growing in the Garden of Innovations in the Montreal Botanical Garden in Quebec, Canada. In Germany, the borago officinalis has been used in cooking recipes for salads and soups for many years. Borage, Borago officinalis, Garden of Innovations at the Montreal Botanical Garden, Jardin Botanique de Montreal, Hochelaga-Maisonneuve, Montreal, Quebec, Canada. Picture of the leaves and stems of the Borago officinalis in the Garden of Innovations in Montreal, Quebec.